The Department of Neurology faculty provides diagnostic and consultative services for all neurological disorders. The department serves as the major regional referral center for patients with movement disorders, including Parkinson's disease, progressive supranuclear palsy and dystonia; epilepsy; stroke; multiple sclerosis; neurogenetic disorders; neuromuscular disorders such as ALS (Lou Gehrig disease) and myasthenia gravis; nervous systems disorders affecting vision such as optic neuritis; headache; and neurobehavioral disorders such as dementia. Click here to visit the department's website. Botulinum (Botox) is the first-line treatment for certain focal dystonias, such as blepharospasm, torticollis, hemifacial spasm and limb dystonia including writer's cramp. Botox is also given to patients with resistant headaches and limb spasticity. Patients are treated one to four times a year, as needed. 1. Diffuse and multifocal brain disorders affecting cognition and behavior (e.g., delirium and dementia). 2. Neurobehavioral syndromes associated with focal brain lesions (e.g., aphasia, amnesia, agnosia, apraxia). 3. Neuropsychiatric manifestations of neurological disorders (e.g., depression, mania, psychosis, anxiety, personality changes or obsessive-compulsive disorders, which may accompany diseases such as movement disorders, epilepsy, cerebrovascular disease, traumatic brain injury or multiple sclerosis). 4. 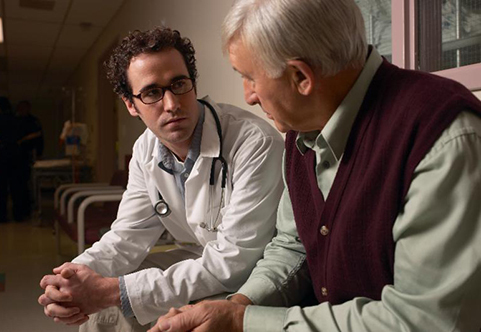 Dementia and Alzheimer's Disease: The Departments of Neurology and Psychiatry, in collaboration with Rutgers University Behavioral Health Care (UBHC), have established an evaluation clinic for patients with cognitive impairments. Patients with dementias, such as Alzheimer's disease, Lewy Body Dementia, as well as patients with traumatic brain injuries, stroke and other diseases affecting the brain, are evaluated and treated. The clinic is staffed by Dr. Daniel Schneider, who is dual trained in neurology and psychiatry. Social workers from COPSA (Comprehensive Services on Aging) at UBHC are also on site to evaluate and facilitate social support and referrals. The clinic helps to address the need for these services in Central New Jersey. Our Epilepsy Center consists of epilepsy neurologists, neurosurgeons, neuropsychologists, nurse practitioners, pharmacologists, psychiatrists, neuropathologist and research coordinators. We evaluate and manage new-onset or chronic seizure disorders. We additionally collaborate with Robert Wood Johnson Medical School neuroradiologists, neurophysiologists, pediatric and other neurologists. Nonmedical treatments, including vagus nerve stimulator (VNS) therapy, resective epilepsy surgery and laser thermal ablation surgery are offered after extensive workup. In addition, clinical trials of new antiepileptic medications for various kinds of seizures are available. Beyond seizure control, we also address quality-of-life issues, including depression, memory issues, driving, reproductive health, pregnancy and bone health. Other advanced diagnostic procedures available include positron emission tomography (PET) scans, high-resolution epilepsy protocol MRI brain scans and ictal single-photon emission computed tomography (SPECT) scans. Evaluation and treatment of headache, migraine, dizziness, disorders of balance, and back pain. The Movement Disorders Center is a major regional referral center associated with the American Parkinson's Disease Association, the Parkinson Study Group, the Dystonia Medical Research Foundation, the International Tremor Foundation and CurePSP. Our physicians provide consultation, diagnostics and long-term care of patients with movement disorders, including Parkinson's disease, progressive supranuclear palsy, dystonia (such as torticollis, blepharospasm and Meige syndrome), essential tremor, Huntington's disease and ataxic disorders. The Robert Wood Johnson Center for Multiple Sclerosis (MS) was established in 2005 at Robert Wood Johnson Medical School in conjunction with Robert Wood Johnson University Hospital, under the direction of Suhayl Dhib-Jalbut, MD, professor and chair of the Department of Neurology, and an internationally recognized leader in the area of MS research. The center provides therapies approved for the treatment of MS at different stages of the disease. We believe in a team approach to MS care. This includes disease-modifying therapies, physical therapy, and treatment for pain, bladder dysfunction, spasticity, and mood changes. Both children and adults are seen by this service. The Neuromuscular and ALS Center provides diagnosis and treatment for conditions affecting muscles and peripheral nerves such as Myasthenia Gravis, muscular dystrophies, Guillain-Barre, diabetic neuropathy, small fiber neuropathy, carpal tunnel syndrome, autonomic neuropathy, inherited neuropathies, and inflammatory neuropathies. Our Neuromuscular and ALS Center has been designated as a Certified Treatment Center of Excellence by the national ALS Association. Amyotrophic lateral sclerosis (ALS), also known as Lou Gehrig’s disease, is a progressive disease of the motor neurons (nerve cells that control the skeletal muscles). As motor neurons are affected, gradual weakness, atrophy, and paralysis of the skeletal muscles occur. These muscles may include those that control walking, arm movements, speech, swallowing, and breathing. Rare subtypes of ALS include PMA (progressive muscular atrophy), PLS (primary lateral sclerosis), and PBP (progressive bulbar palsy) More Info. The Neuro-Ophthalmology Program provides the diagnosis and treatment of brain disorders of the visual and ocular motor systems. The Stroke Program provides 24-hour inpatient, emergency evaluation and treatment of patients with acute cerebrovascular events, including stroke and intracranial bleeding. The program has in place a multidisciplinary approach, which involves vascular neurology, diagnostic neuroradiology and endovascular surgical neuroradiology, to rapidly evaluate and appropriately treat stroke patients. Acute treatment for patients with ischemic strokes includes intravenous Tissue Plasminogen Activator (TPA), as well as endovascular therapies including intra-arterial TPA and mechanical clot removal in select patients. The Stroke Program utilizes dedicated neurosurgical critical care and neuroscience/stroke inpatient units with nurses trained in the care of acutely ill neurological patients. Appropriate consultation on surgical, cardiac, rehab and dietary approaches to stroke management and prevention are readily available. If you are experiencing any warning signs of stroke, please call 9-1-1 immediately. Every minute counts.